In the search for decent sponge-and-press services, I recently tried Press2Dress, a dry cleaner based in south London and run by Michael Norman. Michael is developing an online service that specialises in cleaning and pressing for bespoke clothing. He has 25 years’ experience in the industry and a small staff with similar experience. Any dry cleaning is done one piece at a time – unlike most dry cleaners, who pile everything into one drum – and on a manual programme rather than automatic. This means there is less agitation of the garments and they can be watched carefully, to make sure they handle the process ok. A pure filtered solution is also used each time. Spot cleaning (the ‘sponge’ in sponge and press) is done by hand using steam and water-spotting guns, as well as a spotting chemical and brushes. Generally this is all that is needed for a suit unless it is heavily soiled – or the marks are oil-based. Perhaps most importantly, pressing is done expertly by hand. I tried the service a couple of weeks ago, to assess how ‘expertly’ it could be done, and the results were impressive. The small marks on my Graham Browne suit (pictured) came out nicely and the pressing was very well done – a lot better than my recent experiment with Jeeves. The lapel roll was retained and the trouser crease was perfect. Michael’s dry-cleaning service costs £40 for a suit, £21 for a jacket; spot cleaning is £30 and £16. That’s less than Jeeves. Of course, unless you’re going to south London, the pieces will have to be picked up – which costs £25. But if you do a few suits at a time, the cost is reasonable. Unless there are particular emergencies with stains, I tend to have my suits cleaned every two years, but pressed every year when they come out of summer or winter storage. I therefore plan to shift to a system where Michael picks up my clothes that have just come out of storage, cleans perhaps half of them, presses all of them, and makes any small repairs that are needed. For a wardrobe of expensive bespoke suits, it is not a large annual cost. Background: For those that haven’t followed previous posts about sponge-and-press services, you can read the review of Jeeves here, and of a similar service to Press2Dress that also does high-end valet services here. In general, suits do not have to be cleaned very often, and should’t be. 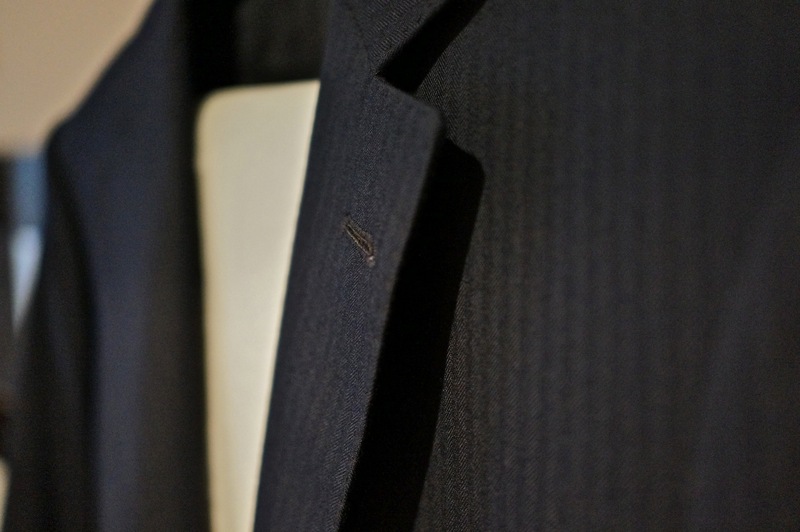 Regular dry cleaning will damage the fibres and drastically shorten the life of the suit. Often all it needs is a good press – the steam pressing that any bespoke tailor will do to a suit before giving it to you. Steam does great things for wool, and the press will give the suit back its crisp finish. Any small stains can normally be done with some spot cleaning – hence the ‘sponge and press’ service that many tailors offer on their own suits. They won’t do this for others’ suits, however, so that has driven my search over the past few years to find a good, independent sponge-and-press service. Press2Dress seems like the best solution so far. You can follow the discussion on A great suit cleaning option: Press2Dress by entering your email address in the box below. You will then receive an email every time a new comment is added. These will also contain a link to a page where you can stop the alerts, and remove all of your related data from the site. Hi Simon, I was always told that washing wool removes natural oils in the fibre so should be avoided as much as possible (therefore have tried to go as long as possible with just a sponge and press). Problem with this is not usually the outside (unless there is a spillage or stain) but rather the inside especially unfortunately under the arm pits etc.! This service is only meant for suits that do not come from tailors who will it for you. Or, in my case, when the tailors are in Naples/Paris and sending them back isn’t easy. Any tailor should also press a suit for you, and as I mentioned that is a good thing to do both for cleaning and freshening up the suit. Most Row tailors will do a sponge and press themselves at a reasonable price. They will also send it to be cleaned and then press it themselves – and for me the pressing is the one thing few dry cleaners get right. The point about taking bespoke suits back to the tailor who made them is an interesting one. Maintenance this way would seem the obvious route. I had four SR bespoke suits from the same SR house some years ago. During the time I was a regular customer they were very happy to clean, sponge and press, but since I stopped using them (for various reasons I don’t have need of any more work suits these days) they are frankly not really interested. I’ve been back a few times and they have agreed to do it, but they make it a chore and I have largely lost faith in them. What’s your experience been like, Simon? Do you go back to your SR makers for maintenance? Do any of them have a published price list for this (mine don’t, which I think is part of the problem). Yep this is a problem, bespoke tailors always sell the idea of a lifetime of use and the fact that a suit can be altered but what they don’t mention is the reality in my experience seems to be they are happy to make alterations which are always going to be necessary over the years for most blokes, do repairs and alterations while you’re still ordering. When they realise the pipeline is empty they lose interest as your not seen as a customer who is generating future profit but is instead running up costs. Since their Business model often means outsourcing alterations (I’m talking about SR usually to soho tailors) and defiantly the dry cleaning (although they press themselves) they have to actually pay each time you come in to ask for something. This inevitably causes some awkwardness. I don’t think Simon is the best person to ask on this sort of problem as I suspect tailors are going to be nice to him because of the blog and therefore receives VIP service. Unfortunately in high end clothing there is a lot of snobbery which p***** me off I must say and I’ve had my share of bad experiences in all sorts of establishments being not just a regular customer but a small regular customer. Worst was probably in charvet where the girl wouldn’t let me go upstairs despite buying hundreds of pounds worth of things as they had a VIP customer up there at the time (one guy with his wife on the whole floor, didn’t have a clue who he was but I wasn’t allowed to breathe the same rarified air in the massive 1st floor). Grrr. My SR tailor sent out a flyer some years ago actively promoting the concept of lifetime maintenance, offering free cleaning and pressing once a year. They have since denied all knowledge of it! The last time I took my suits in, they pressed them all but ‘forgot’ to do half the repairs that I’d pointed out. When I asked them to arrange for delivery back to me they seemed completely flummoxed and quoted a ludicrous price. I ended up booking a taxi myself over the phone to collect and deliver, for a quarter of what they had quoted! What is the address of Michael’s establishment? I think that’s the place – I haven’t been, I’ve only experienced Michael’s remote service. I don’t know what the 4/£15 offer is, but it sounds like that isn’t the bespoke service! I actually said I change suits around twice a year. They are only properly cleaned every two years! Some old Savile Row hands say you should never clean your suits at all. But that does depend on stains, accidents etc, and they would brush their suits down after every wear (deals with most atmospheric dirt). Is there any truth to the idea that it’s better never to clean your suits at all simon? It reminds me of some denim heads belief in never washing jeans instead sticking them in the freezer every once in a while. Does dry cleaning really ruin a good suit? Rups. It’s not good for a suit generally, and should be minimised. But unless you’re very careful with it, and are happy to do some spot cleaning yourself, it will usually need it every so often. Michael does the dry cleaning process cause the suit to be affected negatively in any way? Why is it seen as bad at all? Of course, I understand the benefits to cleaning the suit, but just wondering what if any are the negatives? Inside a bespoke suit you have a canvass with stitching through it, does it affect the shape or anything? Thanks Michael (& Simon). When I next need to dry clean some of my suits Ill send you a message. Cheers. It’s mostly in two suit boxes, in my garage and under one of the beds. Each holds four suits/jackets. There are lots of storage companies out there (e.g. Big Yellow) but none I know that specialise in quality clothing. I use sticky sheets that attract and then catch the moths. It’s by no means a complete solution though. I swear they get immune to it. Cloth bags should protect most anything. I used Press 2 Dress (Micheal Norman) recently to have my GB bespoke 3 piece suit with extra trousers dry cleaned and pressed for the first time. I had been worried about getting cleaned but needed to as there was a grease mark on one of the pairs of trousers. Excellent service and the suit has come back as good as, if not perhaps slightly better than new. As I live in Cheshire, Micheal arranged to pick up and drop off my suit with a family member in South London. Suit was returned on good quality wooden hangers in a proper suit carrier. £95. Recommended and I will use him again. This is my first remark on this website, but a well-deserved one. I took a fair few bits (some Graham Browne, some other bespoke, and some slightly dodgy secondhand stuff) to Michael and was extremely pleased with the results. Not only did the clothes come back in great shape (as another reviewer says, perhaps better than new) but he was happy to offer me advice on repairs, maintenance, etc. and even tackled a few older stains which had been unmoved by previous efforts. I have gone to a few places recommended here on Permanent Style, and by far and away the most rewarding aspect of the effort is meeting the people involved. This is no exception, and I really enjoyed chatting to Michael about dry-cleaners he’s known, chemicals he wishes they’d never banned, and clothes he’s bought back from the brink. Bespoke is a big expense (for me, at least) and taking the time to get it looked after properly has made me rather less squeamish about continuing down this path. An absolutely stellar service, and all south of the river! Thank you Simon for the recommendation. I contacted Michael and arranged for him to collect and sponge and press 5 MTM suits (that aren’t my best but I think still warrant taking care of properly) and a spare pair of trousers. Michael was the consummate professional and I wholeheartedly recommend his service. The suits came back just as good (if not better) as when my tailor presses my bespoke clothes and Michael also managed to remove some long present water stains on the pair of khaki trousers. He also mended a torn pocket, gave me an extra lint roller, returned my original hangers and provided new hangers and high quality garment bags. He even gave me some advice on future care of a Loro Piana over coat that had been ruined by a previous dry cleaner. Michael himself is extremely knowledgeable and a pleasure to deal with. All in all I’m a very happy and certainly repeat customer. Thank you for the recommendation! I recently contacted Michael for a sponge & press of my three piece bespoke suit. Suit came back looking better than new! Great service and wholehearted recommendation from another happy customer! I recently got a suit dry cleaned from Press 2 Dress and it did come back with a very good finish. Not only the cleaning but the customer service was superb as well, I got a call from Michael when the suit was done informing me that it is ready for collection. I will be taking a few more suits now for the sponge and press service. Excellent recommendation Simon! The quality of the service and the attention to detail was utterly amazing. I shall send a lot more stuff Michael Norman’s way. Just to add my experience to the post. I had a new pair of linen trousers made by Graham Browne. Got caught in a downpour in London on their first outing and they got completely soaked. Unfortunately as they dried, tidemarks appeared across both thighs. I contacted Michael and as I live north of London, was able to post them to him. Fantastic service – marks removed, beautifully pressed and returned in appropriate packaging. Thanks too, Simon, for the helpful recommendation. This weekend I dropped by Press2Dress with a couple of my bespoke suits, Michael insisted on knowing when I was planning to arrive so he could insure he was there in person. Once there Michael took each piece out of their suit bags one by one and inspected them while explaining his process’ and the time frame to complete (this is going to be a little longer than ones average High Street dry cleaner, because as Simon explains above this is truly a “bespoke” service). Although each of the suits represent a significant investment emotionally as well a financially, Michael left me feeling extremely confident that I was in safe hands. When I get them back, (I live in Hampshire so Michael offered to send them back to me for a very reasonable cost) I will post the results, but my expectation is that like others here, I will be delighted after all thus far the experience has been exemplary! I am perhaps fortunate that I live approx. 3 miles from Press2 Dress in Sutton so I am easily able to drop items off. So far I have had 2 suits and a jacket cleaned using the bespoke service. The results were truly excellent and included minor repairs to one of the jackets which had started to split the seams at the top of the vents. The suits are returned on excellent wooden hangers with wide shoulders in proper breathable suit carriers. The sleeves are also padded with tissue paper to retain the shape so the suit is ready for storage if appropriate. I currently have another suit with Michael for bespoke cleaning and my dinner suit for sponge and press. All in all a fantastic service that I would thoroughly recommend. As promised I am following up my previous post having now received my cloths back from Press2Dress. Michael and his team have done a truly wonderful job. Everything came back beautifully finished, on good quality hangers and suit bags, in addition they were dropped off on a Saturday morning not by a courier but by personal friends of Michael (though I can’t assume thats the norm). If you have good quality clothing which like me you were dreading taking to your local dry cleaners then fear not, go to Press2Dress you can trust them to return your clothing in perfect condition! I can wholeheartedly recommend Press2Dress. Found the service to be first class and very convenient compared to the rather terse interactions I had with Jeeves when enquiring about their bespoke service. Michael and his team did an excellent job on my three piece suit and wool overcoat and certainly will be using them again in the future. Picked up last Sunday from central London, returned this Sunday. 3 suits and one jacket, including one suit that was on the way out. Now having been ‘properly’ cleaned and pressed it’s had a new lease of life. Others were just as good. Thoroughly recommended, and comes with decent suit bags and good quality, extra wide hangars. When walking past Press2Dress, you could well mistake it for a run-of-the-mill dry cleaner. That is: a shop with little knowledge of (or care for) quality clothing. And in my experience you couldn’t be more wrong. Michael is joy to talk to and really knows his stuff – he fully appreciates the value of bespoke wear and his work reflects that. I have had a number of suits pressed (and a couple cleaned) by Press2Dress and I’ve always been pleased with the finish. Nothing seems too small a task for the team and their customer service is top notch. I highly recommend them. Michael is a top bloke. He cares about what he does and offers a high quality service with a personal touch. I highly recommend him. Sorry to find you’re no longer at the Sutton shop. Although not a frequent customer, you were always my first choice for any cleaning or repairs etc. I don’t want to trust my 70 year old uniforms to a stranger. Please let me know if you set up your bespoke service. Simon, is there a dry cleaner in central London (or not that far out) you’d recommend? I recently returned from holiday with a tiny mark on the back of an unstructured Corneliani jacket (I can live with it, but I’d like to have it sorted if possible) and yellowish marks on the back of a white T-shirt courtesy of spray-on suntan lotion (annoyingly). For ready-made tailoring, most of the dry cleaners are pretty similar. Thanks Simon. I’ve just discovered suntan-lotion stains on two more T-shirts, plus (very depressingly) on two of my custom shirts by Luca Avitabile. I’m careful to use non-staining deodorant, but I never realised suntan lotion could be so ruinous – until now! I’m praying they can be salvaged; I’m not sure if you’ve experienced anything like this before. OK, thanks. I’ve emailed Michael Norman to see if he can help/advise. I’ve tried to email Michael but had no reply – I think it was his old email related to his previous business. Does anyone know his new contact details or if his new business is up and running? Any thoughts on how to best get a water-stain (water-mark) out of a blazer that is wool, linen and silk (just 3% silk). It’s a textured blazer, and it got wet underneath an A/C vent – the water leaked down and “stained” the blazer in a large area of the shoulder and midsection (on the right side). Should I just go the dry-cleaning route? It happened about 2 weeks ago – so, unfortunately, it’s dry now. I’ve heard of steaming these out (indirectly), and I’ve also heard of using a brush (but that seems futile). I’d take it to a specialist dry cleaner if you can. Ask them about it and what they’d suggest. Try to judge their level of specialism by whether they’d just dump it in the dry cleaner or will try to sponge it first.